Bring a large pot of salted water to a boil. Cook spaghetti according to package directions. Drain, reserving ½ cup pasta water. In the meantime, place Poblano peppers directly over the flame of a gas burner or grill*. Allow to completely char on all sides. Remove peppers with tongs and place in a bowl fitted with a lid or aluminum foil. Allow to sit 10 minutes. Once slightly cooled, rinse under cool water until charred skin is all washed away. Remove stem and seeds. Place the roasted pepper flesh in a food processor. Add avocado, tomatillos, garlic, cilantro, lime zest and juice, nuts, salt, pepper and ¼ cup olive oil to the food processor. Process until smooth, stopping to scrape the sides at least once during processing. Add additional 2 tablespoons of olive oil through the vegetable shoot. Taste and adjust seasoning and, if necessary, add a pinch of sugar to balance the flavor. Bring ½ cup pasta water to a boil. Add spaghetti and toss to combine, cooking 30-60 seconds until water has thickened. Add Poblano pesto and toss to combine*. Place pasta in a serving bowl. 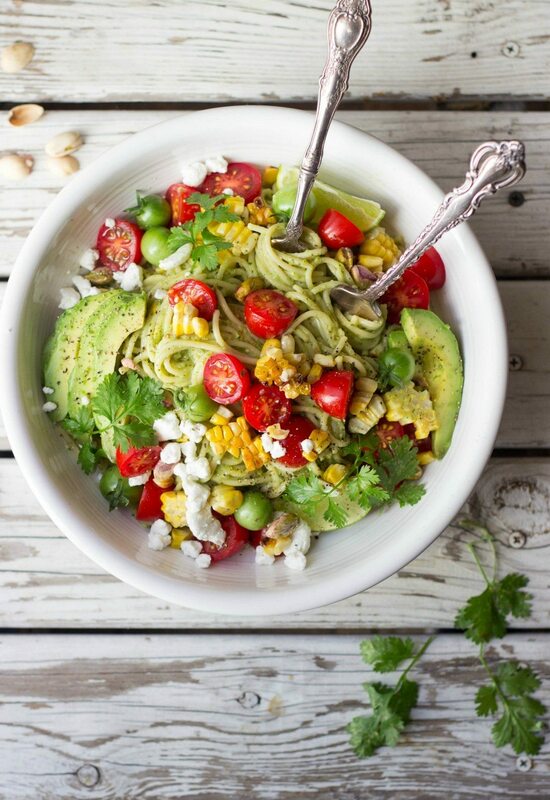 Garnish with tomatoes, cheese, sweet corn, nuts and cilantro.